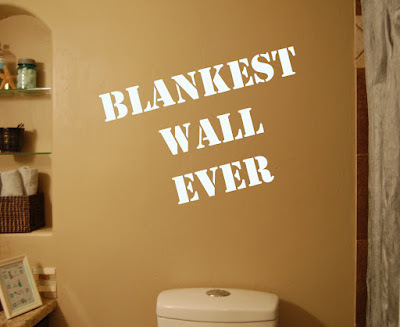 If you recall from all my poorly photoshopped decor options the other day, I've been a bit stuck on what to hang in a certain spot of wall in my small upstairs bathroom. Of all the ideas I shared, I kept going back to the Umbra wallflowers. I wasn't sold on the wallflowers themselves, but I was really drawn to the the way they looked in the space. I decided that I'd be happiest if I found something asymmetrical and open. I got a lot of great comments and emails, and several of you suggested ironwork -- and while I do think it can be really attractive in a home, most of it isn't exactly my style (I guess I have a style?). I wanted something more casual and maybe even a bit quirky. The moment I read the word 'branches' my mind started racing -- and while it wasn't necessarily racing in the direction Teri described, I defitely owed my inspiration to her. Next I called my sister to interrupt her while she was working (her "real" job really cramps my style sometimes) and she suggested doing the same thing. The next thing I knew, I was trudging through my snowy backyard with a pair of pruning shears. 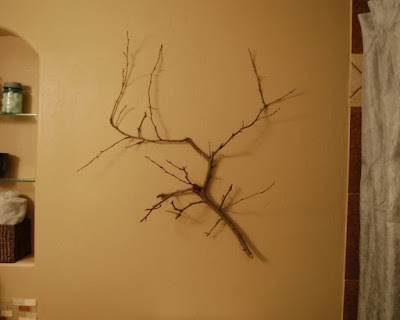 If people can turn pieces of driftwood into coat racks, I decided I could hang a branch on my wall and call it art, right? 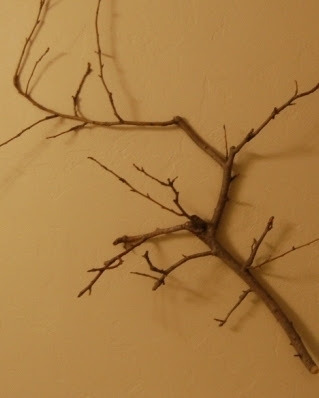 I have a thing for natural items in my decor, and I respect that not everyone might understand or agree with my design decision to chop a branch off my apple tree and hang it in my bathroom. But I don't care about that because I'm too busy frolicking on cloud nine with my new branch. Granted, it wasn't love at first sight; I'm a discerning lady. I had to go through several rejects before I found my prince charming branch. Once I'd made a commitment to the apple tree branch, though -- everything just fell into place. It was oh-so-easy to hang. 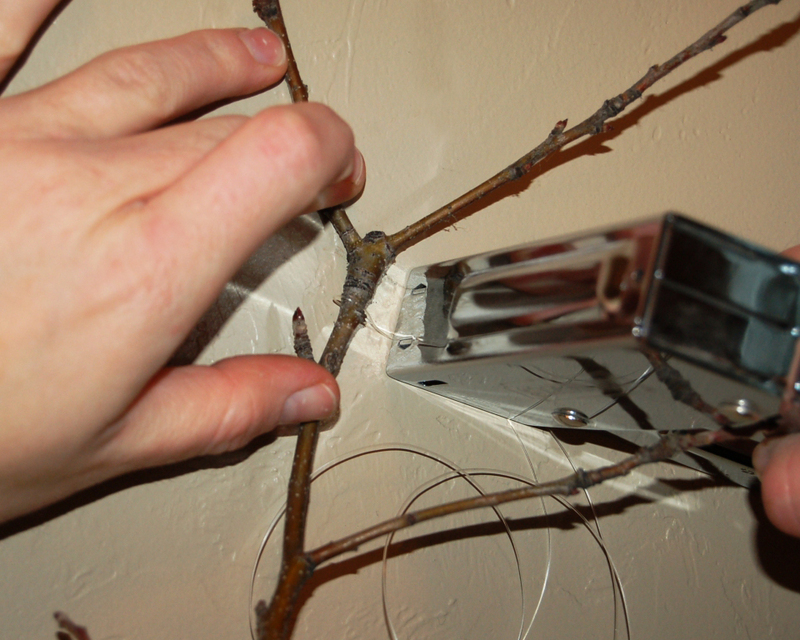 I just wrapped a few sections with clear fishing line, pulled out my trusty staple gun and stapled the line to the wall. 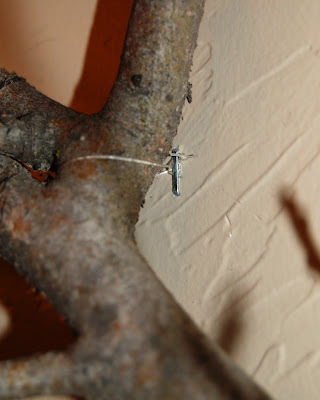 I pulled the fishing line taut so the branch would sit directly in front of the staple, tied several knots in the line to keep it in place and trimmed the edges. 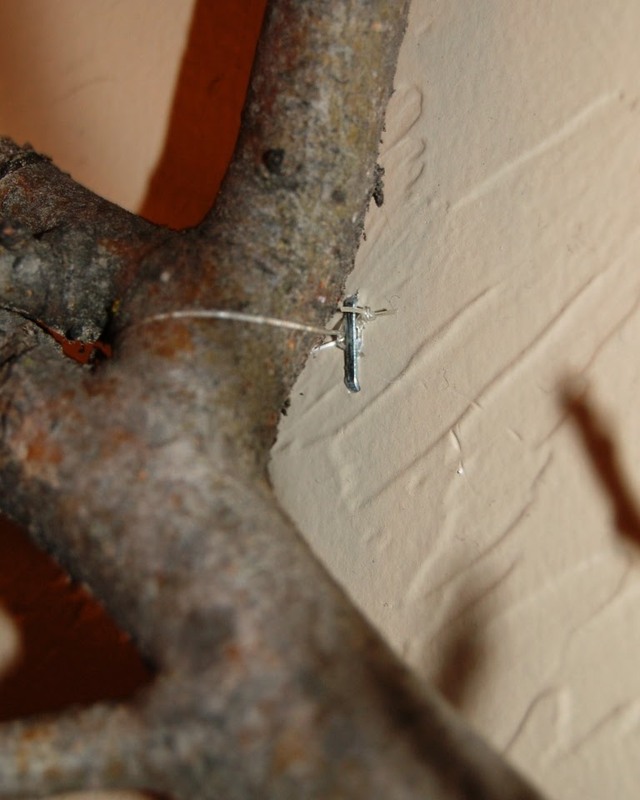 And the end result is a branch that looks as if it's floating. I couldn't be happier! For a project that cost me $0, it's grand -- and sure, I may replace it one day if I stumble upon a great piece of driftwood, but for now this works really well and fills the space. My husband is even slowly warming to the idea, especially when I showed him how I'm decorating it for Christmas. Yes, I decorated my bathroom already. It's one room, friends... let me have one room. I love Christmas (and my branch!) so. very. much. I'm so glad you are happy. I like it. Not in love with it, but I think it would grown on me! Good job!!! Cute! I love natural elements in decor, and I love that you can easily make it seasonal at the drop of a hat. Nice job! LOL! Since your sweetie will be the one spending most of the time looking at that wall directly, I'm glad to hear of his approval. Seriously, though. Way cute. 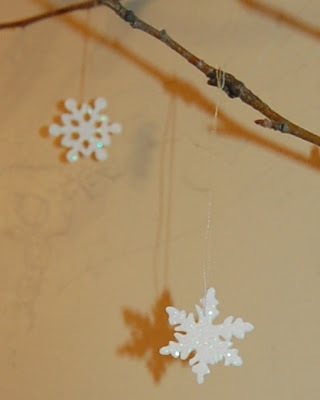 And the decoration idea is awesome. I love seasonally decorated bathrooms. I'm always a bit sad when St. Patrick's Day rolls around and Mom finally removes the Christmas paraphernalia from her bathroom. I was originally for the iron wall hanging, but I am a big fan of this. I do think it would be cool painted though. I love that you decorate your bathroom for Christmas. I used to hang Xmas shower curtains and go Christmas Crazy. I toned it down alot. I like the branch. I have many blank walls and sometimes I get so stuck. This came out great can't wait to see it for Christmas! What an inventive idea. And I love that you can dress it up for Christmas. great job!! I think this is awesome! I love texture on a wall. I've done a similar idea but added hanging picture frames as a display piece! Check it out! I'm off to be your newest follower! I couldn't resist clicking on the photo at be different act normal because I loved it. Beats metal scrolly-s that everyone and their mother has anyday. 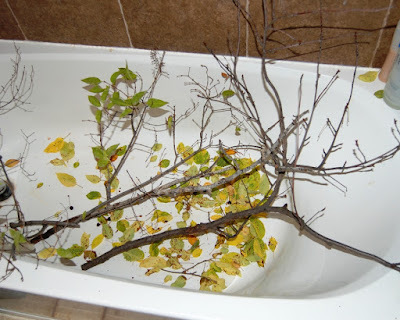 And the fact that you used the words "busy frolicking with my new branch" in a bathroom post? Awesome. I think it is great! You found the perfect branch! And I like the idea of adding seasonal decorations! Cute! I love natural elements in decor! how to repair inflatable hot tubs Thank you for your blog article.Really looking forward to read more. Great.